The 80’s was the decade of great Christian music. Stryper led the way and several other bands followed. Barren Cross, Bloodgood, Holy Soldier, and Guardian set a new direction and gave musical hope for a multitude of young people who grew tired of what passed for “music” in that generation. 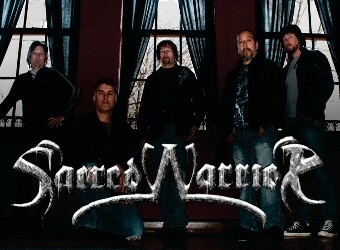 One band that rose up during those formative years was Sacred Warrior. What made this band special was their no-nonsense lyrics that confronted listeners with the biblical gospel. They were never afraid of confronting sin and speaking plainly about the problem of evil. SW eventually broke up and went their separate ways. Almost thirty years later, Sacred Warrior has returned with a new lead singer and a fresh, updated sound. Their new album, Waiting in Darkness has all of the features described above. The only difference is this: The music is faster and the rock is heavier. In fact, this is their heaviest album to date. It should come as no surprise that this brain-rattling music is accompanied by the same non-compromising approach to the gospel. Each song on the album is a testimony to the gospel of grace. Fear Me is a bold declaration of the sovereignty of God. Fans of A.W. Pink will immediately wonder if the guys in Sacred Warrior have been meditating on the classic, The Sovereignty of God! Long Live the King continues to confront the listener with the sovereignty of God over all things. Jealous Love is a ballad that glories in the Cross of Christ. Day of the Lord is the token eschatological metal anthem and is rerecorded from their first studio album, Rebellion. This one is a real blast from the past! This is the kind of music that put Sacred Warrior on the map. Fans of Sacred Warrior will only be encouraged by their latest record. The music is tight, sounds current, best of all – exalts the Lord Jesus Christ!